Bookmans Northwest Presents: Author Day Bookmans Entertainment Exchange Northwest 3733 W. Ina Rd. 09feb10:00 am3:00 pmBookmans Northwest Presents: Author Day10:00 am - 3:00 pm Bookmans Entertainment Exchange Northwest, 3733 W. Ina Rd. Bookmans Northwest is taking a day during Love of Reading Month to honor authors local and national. Join us on February 9th from 10am-3pm for author readings and signings. We invite you to buy books, get them signed, meet the authors and ask them questions. Featuring NY author Gray Basnight! 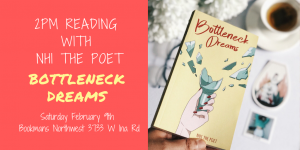 Bottleneck Dreams is the debut poetry collection of upcoming author, poet, and artist, Nhi The Poet. The collection looks at a common subject, love, through both a nostalgic and retrospective lens. The book is divided into four parts, which when read in order, paint the ever familiar picture of a first love. Even so, each part of the collection serves to recall something close to each reader and aims to stir within each of us a longing for a taste of the past as well as a desire to rework our own experiences into something that can only be translated into the present as beautiful. 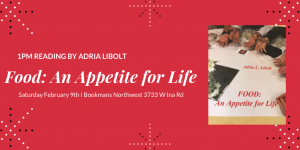 Food: An Appetite for Life by Adria Libolt is about the love of food served up with stories, surprises, conversations, and laughter. The book suggests that eating can be complicated and messy too but is a language of hunger and longing. You will wonder why we eat the way we do, the state of our food, how it is related to fashion and religion, and what we think about abundance. You will consider the relationships between dependence and waiting on others especially when traveling in other cultures. You will experience how food is always a substantial gift.